Safety: Your heating and air conditioning equipment should be checked regularly to assure no situation exists that puts lives or property in jeopardy. Efficiency: Equipment will naturally lose efficiency over time as components collect dirt and motors age. Regular service keeps your system clean and operating efficiently. Comfort: Maintaining the proper temperature and humidity levels in your home requires your system to be in top condition. Indoor Air Quality: Regular filter changes and duct inspections are critical to maintaining a healthy indoor environment. 21 point check up performed by a Spencer technician twice a year. 10-15% discount on all repairs performed by Spencer Air Conditioning on the covered system. 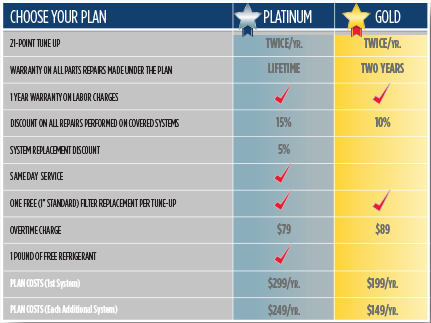 2 year or lifetime warranty on all repairs made under the plan. One free diagnostic fee per year (Platinum plan only). One FREE filter replacement per Tune-Up (1” Standard Size). Hours of Service – All Tune Ups, free diagnostics and warranty work performed under this plan must occur Monday through Friday: 8:00 am-5:00 pm. After hours calls will be charged either $79 or $89 per system, depending on plan. Maintainable Condition – This plan assumes the equipment is in maintainable condition. Should repairs or replacements be found necessary upon initial inspection, recommendations for required repairs or replacements will be submitted to the owner for approval. Not all items are applicable to every system. Technician will need access to water and electrical power to complete service. Two year or lifetime warranty on repairs only continues if the CMP remains in effect. Filter Replacements – This plan includes replacing one standard filter at each visit. Additional filters are available at additional charge. Filters that are determined to be special order must be purchased by the dozen. The plan member will be charged for 10 filters at the 10 – 15% discounted rate. Notification of Service – You will receive notification by phone, mail or e-mail when it is time to schedule a maintenance visit. You will receive only one notification and unused visits will be forfeited on the plans expiration date. Payment – This plan does not take effect and no discounts can be given until full payment is received. No service will be rendered under this agreement on past due accounts. Homeowner agrees that Spencer shall in no event be held liable for damage or loss caused by delay or loss arising out of the performance of this contract. Spencer is not liable for water condensation damage caused by preexisting air conditioning drains not installed by Spencer.